Humanitarian and Nobel Laureate Lech Walesa will be on the campus of Sam Houston State University to talk about “Challenges of globalization – values in the changing world” Thursday, Oct. 29, at 11 a.m. in the Criminal Justice Center auditorium. His presentation is open to the public, and there is no admission charge. This is Walesa’s second visit to Sam Houston State. In 1996, the university honored him with the Sam Houston Humanitarian Award for his outstanding achievements against incredible odds. The award, created in 1993 in honor of the 200th anniversary of the birth of American statesman and Texas hero Sam Houston, recognizes responsible and distinguished leadership and service; notable contributions to humanity; a record of civic and cultural involvement; pursuit of educational and scholarly quest; and empowerment of others toward equality for humankind. Walesa was the face of Poland’s anti-Soviet struggle during the 1980s, and later became the president of Poland in that country’s first free election in half a century. He began his historical journey in 1970 when, while working as a shipyard electrician in Gdansk, he joined Poland’s labor movement. In the years that followed, he helped found and lead the Solidarity union movement, which began pushing for economic and political reforms through a series of strikes and peaceful demonstrations. It was a struggle to which the labor leader would devote 20 years of his life, and his efforts earned him the Nobel Peace Prize in 1983. 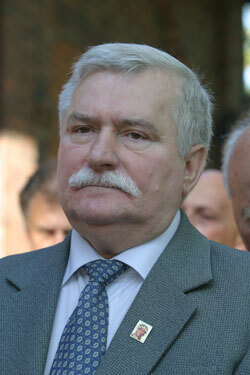 The Solidarity movement strengthened under Walesa’s leadership. As a result of a union-led revolt, the Polish communist government was forced to hold parliamentary elections in 1989 and suffered a humiliating defeat. In 1990, Walesa was elected the first president of the Third Polish Republic. In the wake of Poland’s transformation, similar revolutions in other Central and Eastern European countries routed communist regimes, and finally, in 1991, the Soviet Union collapsed. Walesa has been granted many honorary degrees from universities in both Europe and the United States, and was Time magazine’s “Man of the Year” in 1981. Among his numerous international awards are the Medal of Freedom (USA), the Award of the Free World (Norway), and the European Award of Human Rights. In 2001, he was awarded the Pacem in Terris Award, named after a 1963 letter by Pope John XXIII that calls upon all people of good will to secure peace among all nations. Walesa continues to work for freedom, democracy and stability throughout the world. His presentation is sponsored by SHSU President and Mrs. Jim Gaertner and the College of Humanities and Social Sciences.